When it comes to home security, many options are available to you for protecting your home. One option includes having a video surveillance system or camera setup in or near your home to monitor for break ins and illegal activity. These cameras may be monitored or are simply for your personal use. Either way, several models exist on the market today, with two of the most common and popular being the dome camera and the bullet camera. Both provide protection and security with continuous monitoring of the area of the house you install them on. But they have some differences that may make one the better choice for your home. We outline these differences below so that you can make a more informed decision about which to install on your property. Both cameras are named after their appearance. A domed camera is a small camera mounted to the ceiling or beneath your exterior eaves 1. It has a domed cover that goes over the camera portion, hiding it from view and protecting it. Because dome cameras are discrete and blend in well with their surroundings, they may be less visible and are more frequently used indoors. Bullet cameras get their name because they look a lot like a rifle bullet. Some smaller models may look more like a tube of lipstick and may be referred to as lipstick cameras. They mount to the wall by a base and can be positioned. They are more visible and, therefore, may discourage theft or vandalism. Both bullet and dome cameras have a fixed position, meaning that when they point in one direction that is what they can see. However, a bullet camera can be easily repositioned to aim another way. Domed cameras must be taken off the ceiling and repositioned and then reinstalled. This makes bullet cameras somewhat more versatile. Domed cameras are restricted, which can make them better for close quarters but not as effective for wide or long ranges. Bullet cameras have a wider and longer range, which makes them ideal for distance and exterior views. They also often have a lip that extends over the lens of the camera to help protect it from becoming dirty and clouded. However, the dome can become covered in grime when used outdoors. This can cause the light to bounce back inside, blurring or clouding the image. For this reason, domed cameras are usually best used in interior or protected areas. Both types of cameras are usually equipped with infrared light, which means that both cameras can be used at night and in low light areas without any issues. 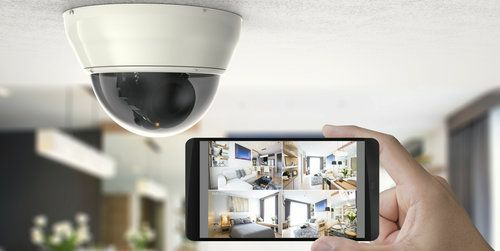 Both types of cameras are fairly simple to install, but domed cameras can be slightly more challenging because they must be installed on a ceiling or eave 1. This can be difficult because you must screw straight up, and dust falling into your eyes and arm strain can make it hard for some people to DIY. In both cases, however, installation only involves screwing the mounting section in question. Dome cameras are not positionable once mounted, which can also affect installation. If you do not place them correctly, or wish to change the location, it must be taken down and reinstalled. Bullet cameras can be adjusted without reinstallation. In most cases, costs for each camera are remarkably similar. Dome cameras typically cost on average $90 per camera, while bullet cameras cost around $100 each. Professional installation of either one costs around $100 per camera. Although if you want to run wires to your cameras, this may add an additional $75 installation cost per camera. In most cases, installing four cameras with professional monitoring works out to about $760 for dome cameras and $800 for bullet cameras. Both cameras can technically be used in both interior and exterior installations. However, dome cameras are used more frequently indoors, while bullet cameras are more frequently installed outdoors. Dome cameras are more discreet, so they tend to blend in better with their surroundings, making them a better choice for interiors. They also have mounting limitations, needing a ceiling or eave to be attached to. For this reason, they cannot be installed far from the home. Because they are often in reach when mounted outdoors, they can be vandalized. Vandal-proof versions exist, however, which make them more difficult to disable. Bullet cameras are more visible and can also be repositioned by anyone passing by. But because they can work from further away and can be installed on a variety of surfaces, they can be mounted higher out of reach, on a nearby tree or post or in other areas that make them more secure. Both cameras are considered durable, but dome cameras tend to last longer. The dome casing, particularly if a vandal-proof option is chosen, helps to protect the camera itself, making it more durable in general. The biggest drawback to either camera is the light. In most cases, it will last for about 2 years of continuous use before needing to be replaced. Opting for weatherproof cameras can extend the lifetime in both camera types. Bullet cameras have been known to become homes to wildlife, where birds and other small animals build nests on the camera. The way the camera protrudes from the wall makes it an ideal nesting place. Dome cameras do not have this problem. Because of the way they are mounted to a ceiling, there is nowhere for the animals to nest. Both bullet and dome cameras have wireless surveillance options, which can cut installation costs and make it easier for you to view the footage from your computer or phone.